In a traditional, stagnant industry, Crop Pro Farm Insurance faces off against behemoth companies that have been around for decades. Fortunately, they’re armed with a unique offering—a new type of insurance that can actually improve farmers’ profits. Our job was to make that message known. Our branding challenge had two components. 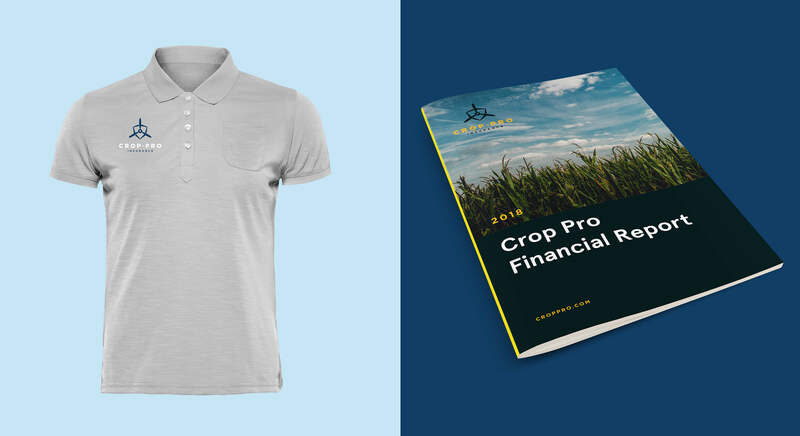 First—set Crop Pro apart from the competition with a clean, tech-forward look and feel. Second—maintain trust with a customer base that wants to know we understand farming. We began by exploring old farm equipment signage and packaging to inform our logo designs, then combined that with slick vector graphics, clean layouts, and drone photography to appear modern and showcase Crop Pro's tech-forward products. With completed brand guidelines, we then applied the new visuals to collateral materials—from apparel to conference signage. 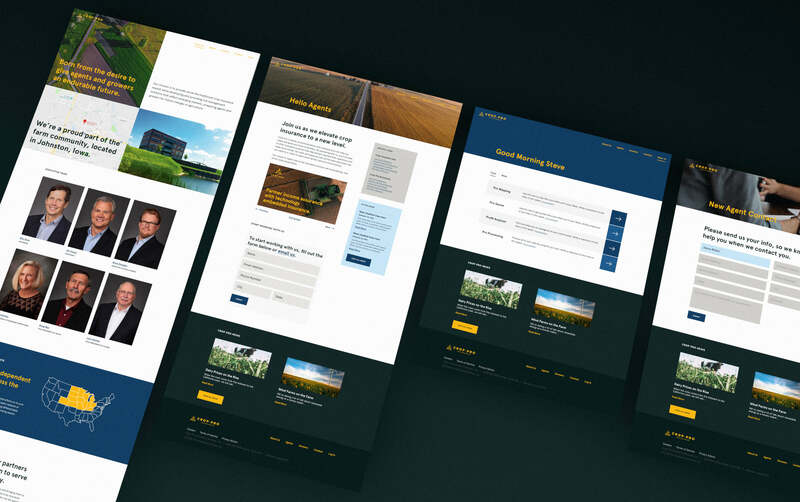 Designing the Crop Pro website gave us the opportunity to expand on our tech vs traditional identity, as we moved their brand into the digital space. 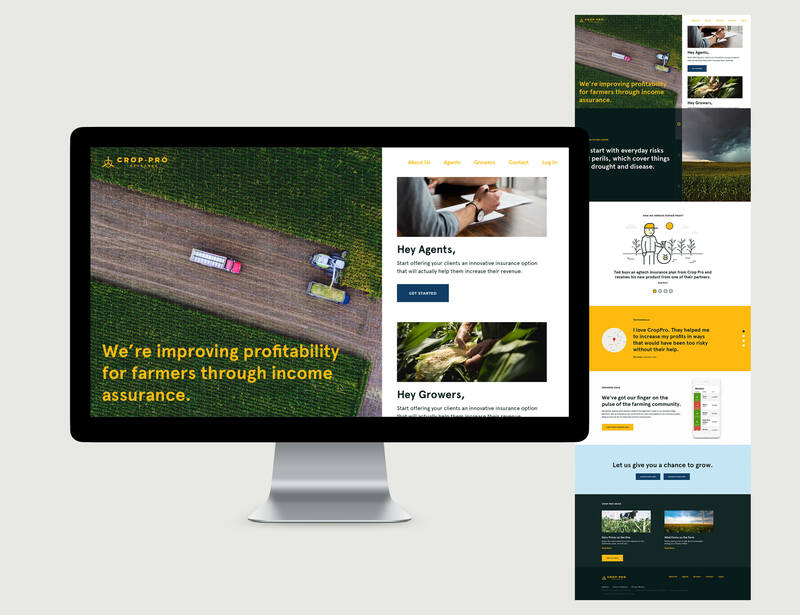 In order to present Crop Pro’s unique profit-making products, we designed a home page that conveys to the user exactly what they offer and how their products work. Farmers and insurance agents are then guided through the on-boarding process and directed to a page that puts them in contact with Crop Pro. We continue to work with Crop Pro as they evolve and develop new products. This working relationship allows us to continually improve their brand and avoid the pitfall of stagnancy, propelling them beyond their competitors.